Ex Police dog car estate with two large air-conditioned and extractor fans dog cages which cost 5000 new when fitted both cages have escape hatch for safety for dogs the car drives excellent it has. Mot Dec 2019. Ford focus car mats. Rear discs, pads callipers and brake hoses. Small bit of rust on wheel arch (shown on picture). Small dint on the left wing (shown in picture). 2009 Ford Ford 1.8 Petrol, Low Mileage! (94,000) ULEZ COMPLIANT√√. Vehicle has been used daily after repair. x2 Remote keys. Automatic front and rear windscreen wipes. Space saver spare wheel. Remote locking. It has been serviced and tested each year, other than that the only expenditure has been for new water pump a couple of years ago. There is also small rust patch on rear driver's side wheel arch, and on driver's door sill (see photos). Well looked after Ford Focus in excellent condition inside and out. A great car to drive. Good engine. One year MOT till March 2020. Very clean and tidy with large boot. Ford fitted Radio-CD and electric windows. 2009 FORD FOCUS ZETEC S, 1.8, PETROL, MANUAL, 5 DOOR, SILVER, ZETEC SPORTS BODY KIT, REAR PARKING SENSORS, SPORT SEATS, ALLOYS, AUX, MOT, SERVICE HISTORY, EXCELLENT CONDITION, DRIVES PERFECT. FORD FOCUS 1.8 DIESEL ESTATE, HAS MOT UNTIL 13. THINGS I HAVE NOTICED ARE THAT THE BONNET LOCK IS BROKEN BUT YOU CAN STILL OPERATE THE CATCH, THE TAILGATE REQUIRES OPENING WITH THE KEY, AND THERE IS A WHISTLY TURBO NOISE (BEEN TOLD IT COULD BE A PIPE LOOSE). Serviced at Ford dealers until 2013, then at local garages annually. Cam belt replaced about 2 years ago. a slight loss of water pressure. At last service advised new rear pads/discs needed soon and found. Only 87k miles. MOT Jan 2020. New lower wishbone bushes and rear wheel bearing as advised at MOT. Ford Focus 1.6ti petrol Titanium X, 2005. Dark Grey, manual, hatchback. Oil and filter change 1000 miles ago. 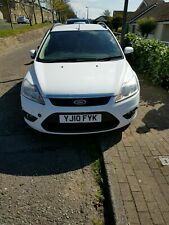 Ford focus 1.6 petrol 2008 58 plate. long mot. cd player. drives very very. we have just got a bigger car. Ford Focus Estate. 1560cc TDCI. All in good working order. Few scuffs and marks for age. 2004 Ford Focus great condition for its age. No rust or rot, bodywork clean with no dents. Rear tyres still got plenty of life. Just under 90k on the clock. MOT until February ‘20. Sailed through the last one. 2004 FORD FOCUS ZETEC 1.6 - now with FULL MOT until April 2020. So full MOT until April 2020. Been using car a lot recently so updated mileage is 100,264. Runs quietly and smoothly. 2 small dents on passenger side doors (as shown), other marks on bumpers. 2007 FORD FOCUS GHIA SALOON 1,8 TDCI. A bloody good clean. Things I can see it will need for MOT are. Wheels could do with a refurb.